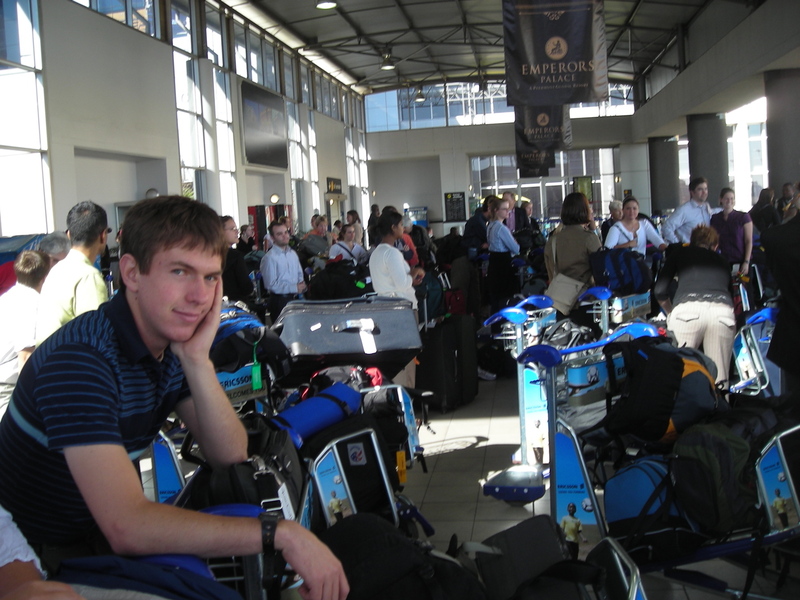 This is a blog of my experience as a Peace Corps volunteer, working in South Africa. My job title is a capacity builder, which means I help increase the effectiveness of a local NGO that does AIDS/HIV related work. Before and after two years of Peace Corps service. Before is from the airport after we arrived in South Africa. The after photo was taken with my host family, following my going away party. The professional attributes that I plan to use, and what aspirations I hope to fulfill, during my Peace Corps service. My strategies for working effectively with host country partners to meet expressed needs. After reading the assignment description and talking with other RPCV (Returned Peace Corps Volunteers), I think the most important strategy will simply be patience. In order to instigate any change, it is fundamentally important to build trust and connections with coworkers in the NGO. Trying to instantly achieve change will be futile and insulting to people who have been working in these organizations for years. As a foreigner from an affluent country, I will be faced with the challenges of breaking down stereotypes and forming open and honest connections with others in the community. Without this, any changes I suggest will most likely end up ignored or will last only until my departure. In addition, even with the trust of coworkers within the organizations, it is important to seek change by providing guidance and making suggestions (i.e., let those closest to the organization instigate change, while I only try to help guide and shape the changes). This helps to empower people and will lead to longer lasting changes. My strategies for adapting to a new culture with respect to my own cultural background. My strongest asset in adapting to a new culture is a skill I learned back during high school. Going to a rather small, new school (only 37 in my graduating class), one is forced to be friends with all fellow students. With such a small student body, students do not form smaller groups as would happen at a large school, but rather learn to befriend everyone. This generally involves being unassuming, welcoming differences (rather then looking for similarities) and exhibiting a patience and genuine interest in learning about others’ ideas and views. Although the cultural diversity in my high school is low in comparison to what I will find in South Africa, I feel that my experience has enabled me to connect more easily with different cultures, beliefs or worldviews, and this skill will be invaluable when I am immersed in such a different culture. The skills and knowledge I hope to gain during pre-service training to best serve my future community and project. During the pre-service training, my primary hope is to learn about the culture and customs of people living in South Africa. Undoubtedly, much of this will be learned from actually living in the community and working within an organization, but I imagine that having a 'heads up' to the different customs will help me to better respond and better adapt. For example, after reading about the central role of religion within the culture, I would appreciate learning a respectful and quiet way of avoiding the topic of my religious beliefs. Although I am interested in taking part in religious events, I would feel uncomfortable professing false beliefs. Learning to negotiate such situations in advance will be beneficial and will help ease the cultural transition, minimizing offense and missteps. How I think Peace Corps service will influence my personal and professional aspirations after my service ends. In terms of personal and professional aspirations following the Peace Corps, I am very open. Primarily, I am confident that my experience will serve as a 'consciousness raiser' (the term is borrowed from Richard Dawkins), in terms of helping broaden my perspective and understanding of the current human condition. In this way, I hope that I will achieve some level of personal growth throughout my experience. As for professional aspirations, following the Peace Corps, I hope to attend graduate school and pursue a Ph.D. The answer to this question always started with porridge (also called pap, a thick white starch made from ground maize meal), bread or rice. The food here places heavy emphasis on such starches as a way of gaining empty calories, as often meat or vegetables are in short supply. The two most common answers were: "God" and "my mom and dad". Here we see both the substantial emphasis placed on religion and on family. But you can also look at this and see a lack of strong role models within South Africa today (in the past there have been Desmond Tutu and Nelson Mandela, but few new people are stepping up to take an important role as a model individual or hero). 4. Cook for my grandmother"
I think that this response speaks accurately about a lot of the cultural values of the rural communities. The first two reference the very heavy emphasis placed on cleanliness, which is often associated with not being poor (people have often expressed to me that the poor wear dirty or wrinkly clothes). And regular baths are also a manifestation of this, with my family members often bathing twice a day – before work and before bed. You can see these values in other parts of life here, such as how dirt yards are often swept on a regular basis, to remove the slightest debris. Houses are also cleaned on a regular basis, with sweeping and polishing often happening weekly. I believe that this value of cleanliness stems from a number of sources, but it is a way of expressing control over one’s life and developing an outward appearance of success (especially in rural communities, where there are so few things to strive for or succeed at). Again, the answers here speak to the importance of families, with people often writing about their aunts and uncles as well as just their immediate family. These familial connections are extremely important here. For example, uncles play an important role in life, negotiating things like bridal lebola (the price a groom must pay to the bride’s father for her hand in marriage), but also stepping in if the father is absent from the picture. In addition, the answers to this question also emphasize the size of the family, with some children describing six siblings. "I have my younger sister her name is Asanda. And my big brother his name is Tshepiso. Also my mom and dad. They don't want to see me with dirty clothes or sleep without washing myself and dishes. And also my granny she wants me to cook for her." This answer harks back to the previous description of the importance of cleanliness. But it also provides insight into how children are treated here. They are seen less as independent future adults, and more as helpers who can aid in the day to day activities. At home, young women are often put to work cooking and doing dishes and other tasks before they even reach adolescence. At school, teachers regularly ask the students to sweep or carry their belongings or go fetch them water, even during class. I am going to just end with quotes from the answers to the last two questions, because I feel there are some very beautiful ones. One note first is that you see the work of the life-skills classes (classes that talk about everything from hygiene to self respect to preventing HIV/AIDS) in some of these responses, and it is nice to see that the message is sometimes getting through. "Love myself the way I am"
"Help people who are sick"
"Pass grade 12 and go to university"
"Believe god and love other people"
"To be proud of my culture"
My blog has been growing cobwebs, it has been long neglected. But school closed early today (the teachers ended up going home at noon, since tomorrow is a holiday), so I decided to come home and post two new entries on my blog. Scroll down to read them. Also, for those interested, I have started a Twitter account: nathanntg. I use it off and on, and post little day to day updates. Upon returning from my trip back to the United States, I began a secondary project within my community. 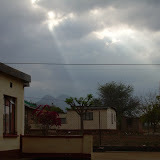 Although I have enjoyed my time with my primary organization (Fanang Diatla, the care-giving organization I was originally placed with), there were many times where there was little work for me and I felt isolated from the rest of the community, as I only worked with a small number of people. So I decided to make the 25 minute walk over to a nearby high school, where I spoke with the deputy principal and offered my assistance with tutoring and career guidance. This was inspired by the number of 11th and 12th grade students that previously approached me asking for those exact things. 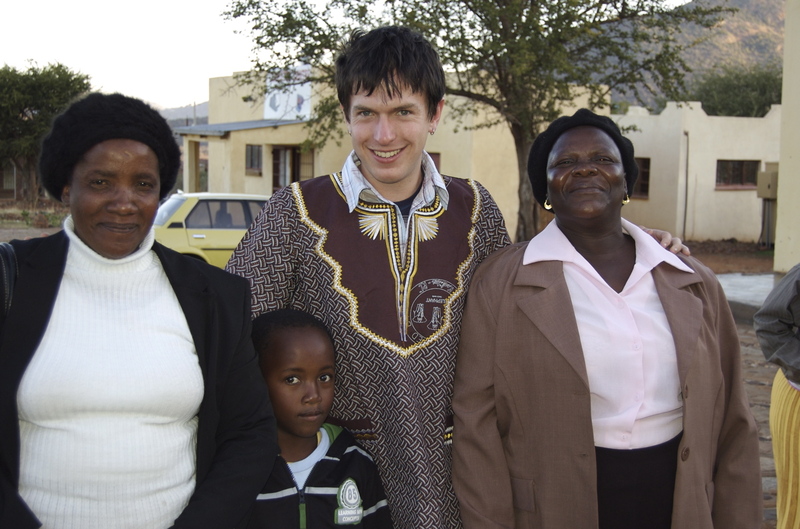 But the school had other things in mind, and the deputy principal asked me if I could assist with teaching mathematics and computers (the school is still severely understaffed and does not have any qualified computer teacher). Coming in the first week, I found that although the school had 12 new computers, they were useless (Windows was not activated, so you could not even turn the computers on). On my first day, I was able to fix the computers (it simply involved calling Microsoft to activate each computer), which was a welcomed change… now students could learn through practical work, instead of theoretical lectures. Since then, I have also helped teach the 12th grade math class, where we spent a lot of time reviewing basic concepts (such as how to graph a line, and what the word arc means). In addition, I have helped with other math classes (one with over fifty learners in it) and have taught a number of computer classes. But now that the second term has begun, I have started to back away from doing too much teaching. As the end of my service is fast approaching, I realize that it makes more sense to work with interested teachers and help give them the computer knowledge or math knowledge they need to teach the classes. So now I have partnered with a few of the teachers, to help give them the computer and math knowledge needed. As I am not an ideal teacher (little teaching experience, and my language skills are not advanced enough to explain either computers or mathematics in Sepedi), this seems like a good situation; the teachers, who already have teaching skills, can then learn certain concepts from me and better pass it on to the learners. Working with the school has provided some variety in my work, and a great opportunity to work and talk with more members of the community. Although there are some disappointments at the school, I am glad for the new addition to my Peace Corps experience and am glad to have something that will keep me engaged during the remaining months of my service here. As my Peace Corps service is coming to a close, I am gearing up for a big transition and the next step in my life. Briefly, I mentioned earlier that I was working on applying to graduate school. After months of waiting (and worrying that I was overly ambitious in applying to renowned schools), I heard from my first choice school… that I got in. This was back in March, but in the months since, more details have arrived. So, much to my delight, I will be moving to Boston and starting at Massachusetts Institute of Technology in the middle of August. The program is in their Engineering Systems Division, and is a Masters of Science in Technology and Public Policy. When applying to graduate school, my primary interest was to look at the emergence of hierarchal systems on a societal level. Particularly, I have been drawn to how people increasingly fit into much larger systems (corporations, governments, etc), and how this leads to more innovation, but also the larger systems take on an identity of their own. For my applications, I ended up writing a statement of purpose that explains this concept in more detail and I have since posted it online (if you are interested in reading it, click here). The program I will be attending is an ideal match for my interests, as I will be able to work with professors who specialize in such emergent systems and their role within businesses today. And I will be able to approach this topic from the angle of economics and policy, which provide great tools for understanding the catalysts of such emergence and how emergent systems can best be utilized in the coming years. Over the course of the two year program, I will study the economics and policy and a science specialization (relating to human systems and business, most likely). In addition, between my work as a research assistant and my studies, I will select, research and write a thesis of my choice. Already, I have begun looking into potential research assistantships and contacting professors, which will help provide the research and focus needed to do this thesis. Currently, I am quite excited about the opportunity of returning to academia. Over the course of the two years since finishing my undergraduate degree, I realize how important the atmosphere of learning and like-minded individuals is to me. So I eagerly look forward to MIT. But also, I have come to appreciate what an important transition is approaching. Over these two years, I have gained great perspective and learned a lot about both myself and people in general. Returning from a quiet, somewhat isolated rural life in South Africa and jumping into the business of graduate school (as well as living on the East coast for the first time) will be a substantial shift. In preparation for that, I have started writing down some of the important events and experiences of my service here, just so I will not lose track of what I gained and learned here. In addition, I will be returning to New Mexico for a few weeks prior to starting graduate school to ease into the transition and have some time with my family before embarking on my next two year journey. I am currently working as a Peace Corps volunteer in South Africa. My work primarily involves helping NGOs to more effectively respond to the continuing AIDS/HIV pandemic. This blog is written solely by L. Nathan Perkins. The contents of this website are mine personally and do not reflect any position of the U.S. government or the Peace Corps. My Peace Corps Blog by L. Nathan Perkins is licensed under a Creative Commons Attribution-Noncommercial-No Derivative Works 3.0 License.